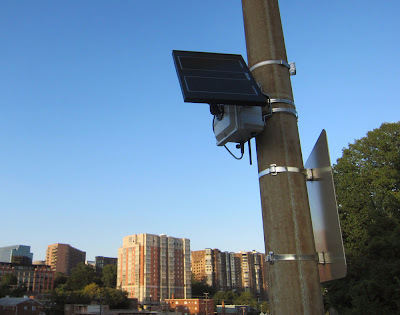 After breaking the story of the new surveillance camera on the south side of Meade St. bridge, the Ode Street Tribune's intrepid team of investigative reporters continues its undercover work to expose covert surveillance equipment in Rosslyn. Recently an equipment box with an attached solar panel has appeared on a pole on the Rhodes St. bridge. The box appears to have an antenna protruding from the bottom of the box. It may be a relay node in a secret wireless surveillance communications network. The use of surveillance cameras has stirred up a hornets nest, but law enforcers find this equipment to be an effective system to help curb disturbing activities before incidents can occur.